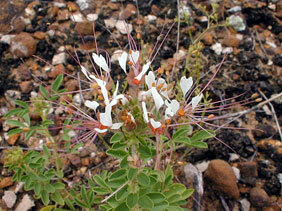 Stems: Erect, usually single, much-branched, sticky-hairy. Leaves: Alternate, stalked, palmately 3-foliolate; leaflets oblanceolate, .75 to 1.75 inch long, .25 to .75 wide, sticky-hairy; margins entire; upper leaves reduced. Flowers: To .5 inch long, long-stalked; sepals 4, lanceolate, purplish; petals 4, obovate to spatulate, 1/3 to 2/3 inch long, white or sometimes purple-tinged; tips usually notched; stamens 10-20, filaments thread-like, .5 to 1.25 inch long, pink to purplish, projecting well past petals. Fruits: Capsules, cylindric, 1 to 3 inches long; seeds many, reddish brown. Habitat: Bluffs, disturbed sites, waste areas, stream banks, and roadsides, on sandy or rocky soils. Comments: The name clammy-weed alludes to the glandular, sticky hairs that cover the plant. Touching the foliage gives the fingers a "clammy" feeling. Clammy-weed has a strong unpleasant odor.